The range of your Geiger counter tells you how much radiation you can measure. Typically analog meter Geiger counters range from 1 to 100 mR/hr. Although some can go as high as 500 mR/hr. With digital Geiger counters the typical range is 1 to 200 mR/hr. However the GCA-06 and GCA-07 series of digital Geiger counters range from 1 to 1000 mR/hr and maintain their NRC accuracy. Does your Geiger Counter come with data logging or radiation charting software? The radiation charting software allows one to chart radioactivity over long periods of time. It allows radiation data to be saved in files and pulled up into other programs like excel. The radiation charting software for Images SI Inc. is shown in Figure 18. This radiation charting and monitoring software is free for downloading from Images SI Inc. website for any compatible Geiger counter. Go here. 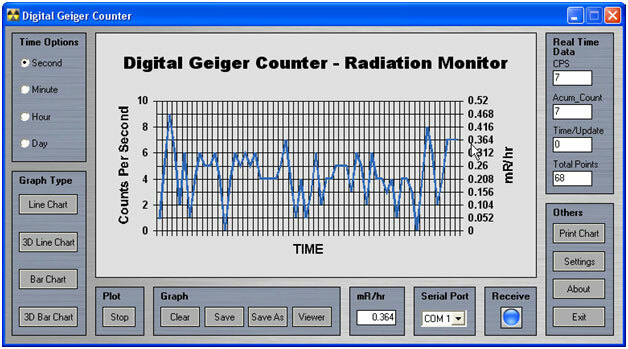 Modern Geiger Counter usually has a digital outputs that outputs a +3-5V pulse with each detection of a radioactive particle. I have tested the Lascar DataQ EL-USB-5 Data Logger, see figure 19. For anyone interested in data loggers you need to look for in a data logger that counts events. Setting up this data logger is simple. Install the program and USB driver on your PC. Install the battery (provided) in the EL-USB-5. Plug the data logger into a free USB port. Run the installed program. Connecting the Data Logger to the Geiger Counter. This particular Data logger has two alligator clip wires we attach the Geiger Counter's digital output too. Many Geiger counters output their digital pulse via a 3.5 mm jack. So we can make a simple interface using a 3.5 mm plug. The red wire connects to the center terminal of a 3.5 mm plug. The black to the ground or outside terminal of the 3.5mm plug. Then plug the 3.5mm plug into the digital output of a Geiger Counter. Once your data are recorded, you reconnect the Logger to the computer and save the recorded test data as a text file. I recorded 298 minutes of background data from a GCA-07. The instructions to import the text data into an Excel spreadsheet are provided in the Data Logger instructions. Once the data is inputted into Excel it can be manipulated and graphed, see figure 20 below. The average Count Per Minute (CPM) was 16 with a minimum count of 6 CPM and a maximum of 28 CMP.